A dental crown is a “tooth- shaped cap” placed over a natural tooth. It replace previously damaged or decayed teeth. A crown can strengthen a tooth that has had numerous fillings, is cracked or has broken. Sometime a crown is the best solution to improve the appearance of a tooth. A tooth is being filed down to make a room for the crown. 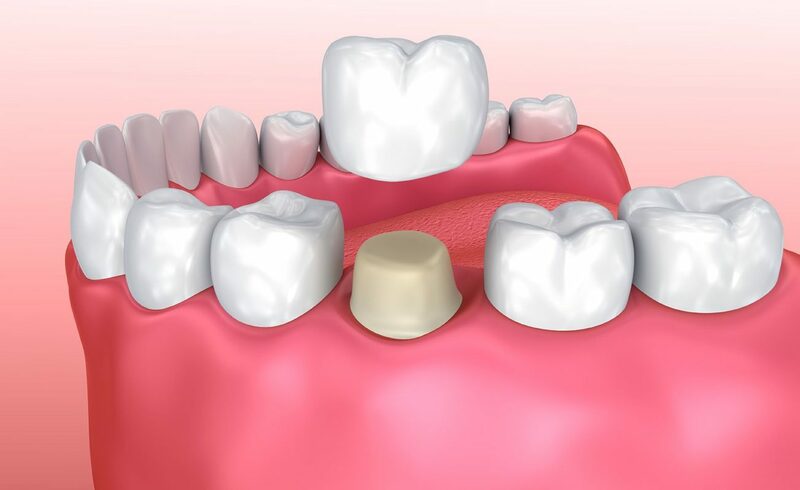 A dental implant treatment is planned when a natural tooth is either congenitally missing or must be removed due to decay or injury.The implant becomes the support system for a new tooth(also called dental implant crown), replacing the root. Missing teeth can be embarrassing, causing people to hide their smile and lose their self-esteem. The space created by missing teeth can easily become infected with bacteria, causing other teeth to shift out of place, and making it difficult for people to speak or eat correctly.We provide dental implants so that our patients can regain their self-confidence, improve their oral health. If one or more of your teeth have fallen out, you may qualify for dental implants as a way to permanently replace the missing teeth.Your Dentist will examine your mouth and jawbone to determine if the procedure is right for you. Before you can get started, your gums need to be healthy, and your jawbone needs to be strong. If there is any cavities or signs of gum disease, this will need to be treated first. Once you are ready for dental implant, they will take an impression of your mouth so that the new teeth can be created in a dental lab. Each tooth will be made to match the size and shape of the surrounding teeth along with having a perfect color match. This way your smile will appear completely natural once done.If dental implant done properly you will be delighted with the results since no one can tell the difference between which teeth are real and which ones are synthetic. The next step in the procedure is to have a metal post implanted under the gum line.The metal post is secured to the jawbone in order to create a durable, synthetic root system that rivals the strength of natural roots with one exception – metal can’t become infected. In a few months time, the metal post and jawbone will fuse together. This creates a level of durability that cannot be replicated in any other type of procedure. Afterwards,dentist will secure the new synthetic tooth to the metal post at the surface of the gums. The new tooth is attached so securely, that patients can eat their favorite foods, maintain an active lifestyle, play sports, and more, without fear of their tooth becoming loose or falling out. Note: Teeth restored with implants can’t get cavities! A replacement tooth, or crown, doesn’t decay like a natural tooth, but still you must brush, floss and care for it and your surrounding natural teeth and gums in the same manner as natural teeth. Regular professional cleanings and dental check-ups also are essential. Pediatric Dentistry, a dental experience that prepares kids for a lifetime healthy dental visits and happy smiles. Pediatric dentists are dedicated to the oral health of children from infancy through the teen years. They have the experience and qualifications to care for a child’s teeth, gums, and mouth throughout the various stages of childhood. Pediatric Dentistry offers a comprehensive range of dental services, including routine dental exams, early dental care, braces, sealants and fillings.In some cases children don’t need full braces but they need an expander or spacers in order to make room for incoming teeth. In other cases, traditional braces are needed along with additional treatments to align a bite.